Shaking Cone for amped up play, making it more difficult to stack the ice cream scoops! A scooper with built in spinner will call out how many scoops to stack on a players turn, or, allow a player to pass! Contnts: 1x vibrating ice cream cone, 12x coloured ice cream scoops, 2x difficulty level base scoops, 1x cone stand, 1x scooper with spinner. Get ready to scoop, stack and score with Oops Scoops, new from YULU! This super fun stacking game challenges players to take turns stacking the ice cream scoops on 'Oops' the ice cream cone. 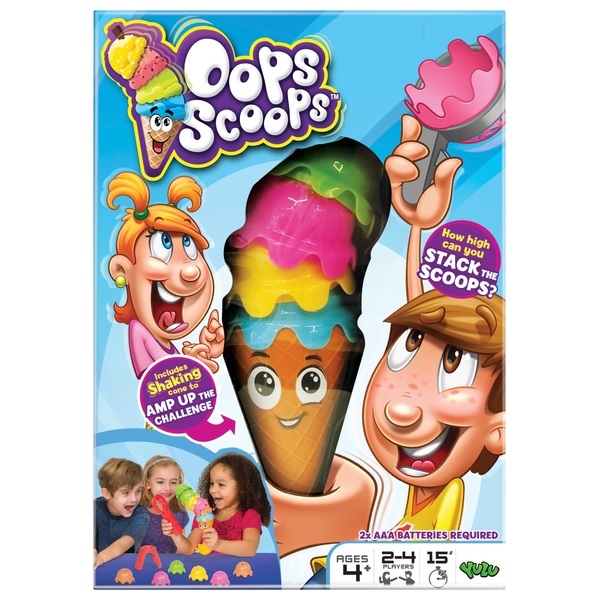 Players compete to build the tallest ice cream tower, but beware, 'Oops' , the shaking cone, can shiver to make the stacking even more challenging and causing the tower of scoops to topple. Spin the scoop spinner to see how many scoops to add. If the scoops fall on your turn, then OOPS - you lose! The last player left wins the scooping showdown! WARNING: The supply terminals must not be short-circuited. Batteries must be removed from the product when not in use. Batteries must be inserted with the correct polarity. Exhausted batteries must be removed from product. Do not mix alkaline, standard (carbon-zinc), or rechargeable batteries. Batteries should be replaced by an adult. Use new batteries to obtain the best performance. Alkaline batteries recommended. Rechargeable batteries are only to be carged under adult supervision. Rechargeable batteries are to be removed from the toy before being charged. Non-rechargeable batteries must not be recharged. Do not mix old and new batteries. EU Warning: Not suitable for children under the age of 3 years due to small parts which could cause a choking hazard. Do not dispose of batteries in a fire.